As the world is made smaller and smaller through the internet, the opportunities for those who have invested on properties in the world wide web through websites, pages and blogs become greater and greater. In fact, the number of internet users continue to grow. In the Philippines, the number of internet subscribers have greatly increased in the past three years and a telecoms company predicts that this number will grow ten times in the next five years. Directly proportional to this is the increasing number of social media users. With these observations, businesses and entrepreneurs are just crazy to not ride the wave of internet marketing. But, the good news is that there are entrepreneurs and businessmen who have become successful through internet marketing. What is more is that they are ready to share some secrets of internet marketing. On March 4 and 5, 2010 from 8:30 am -5:30 pm at the Crowne Plaza Galleria, Philippines, the 1st Asia Internet Congress Philippines will be held. They will be featuring the sharpest internet marketing minds of today and talking about topics like internet trends and opportunities, search engine marketing, copywriting, blogging, corporate branding in the internet and many others. This is one event I don't want to miss! 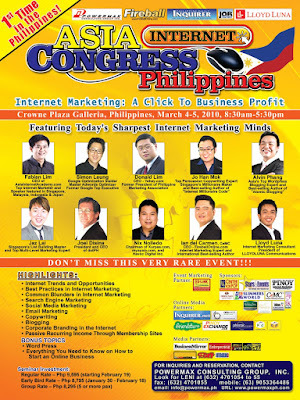 For more information and to register, you can visit www.asiainternetcongressphils.com.